Wobeck Crane Services launch their new website to demonstrate their unique crane company. Based in Ripon, North Yorkshire the team at Wobeck Crane Services operate spider cranes which have many advantages over conventional cranes but still deliver lots of lifting power. The launch of the new website seeks to demonstrate this to the wider business community and general public who may need a crane lift but have site based restrictions and are unsure who to contact for assistance. Contract lifts can be performed if required with all the paper work undertaken by specially trained staff and the crane operated by a specially trained individual. “The launch of our website for Wobeck Crane Services marks an important milestone for our business development. We know our cranes, their size, and their capabilities but when people think of a crane they think of a large lorry mounted machine that you see on a motorway or rising high above buildings. Our service isn’t like that. Our cranes are unique; they have small foot prints and can get into, and operate in, tight spaces but are still strong enough to carry out heavy lifts. It means that where clients are short on space, have difficult terrain to navigate or need a more specialised service we can help. Our website is a mechanism for us to demonstrate our capabilities to our current, and prospective, clientele. Needless to say we are very happy with our new website”. Got a question or looking to hire one of our cranes? News : Our spider goes shopping! Rossett High School in Harrogate wanted to construct a new classroom facility based on a steel frame construction. Under normal circumstances a lorry mounted crane would have completed this job without a hitch, however, how do you drive a lorry mounted crane through the corridors of a school to access the site? You can’t. What about the floor where the steel beams are to be lifted is weight sensitive and the crane has to be bear load in specific places? A lorry mounted crane is a fixed width so that won’t work either. 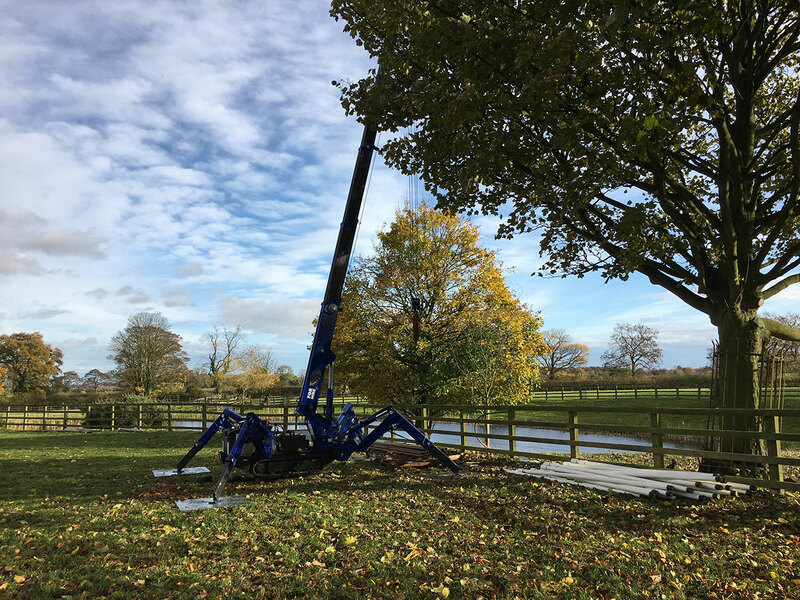 We had a borehole installation in a difficult position across uneven, wet, boggy ground and the pump needed removal so that a new pump could be installed. We could get a normal crane but it would have to be extremely large due to site restrictions, meaning a significant cost. The guys at Wobeck and their crane were fantastic. The crane tracked across the ground without a problem and carried out the work a good deal more cost effectively than would have been the case with a bigger lorry mounted alternative.